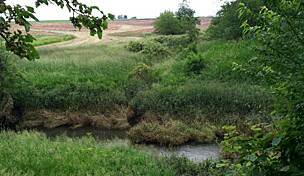 Caution: As of August 2017, the trail is closed due to storm washouts from Mile 13.4 to Mile 13.9; this closure is located approximately 2.5 miles north of Princeville in Peoria County. 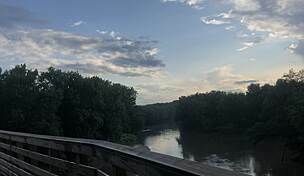 The trail is also closed from Wyoming (Mile 20) to the Spoon River bridge (Mile 22) and from Mile 22.75 to Mile 23.5; both of these closed areas are between Wyoming and Toulon. Additionally, the trail is closed from Streitmatter Road (Mile 12.2) to County Line Road (Mile 13.8) between Wyoming and Princeville. 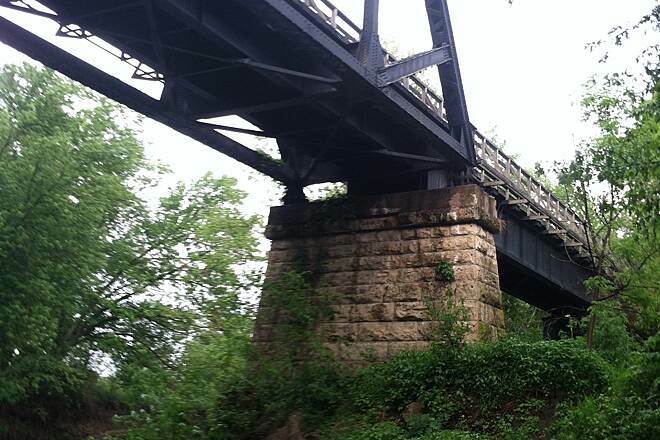 Check the the Friends of the Rock Island Trail Facebook page for updates on the repairs. 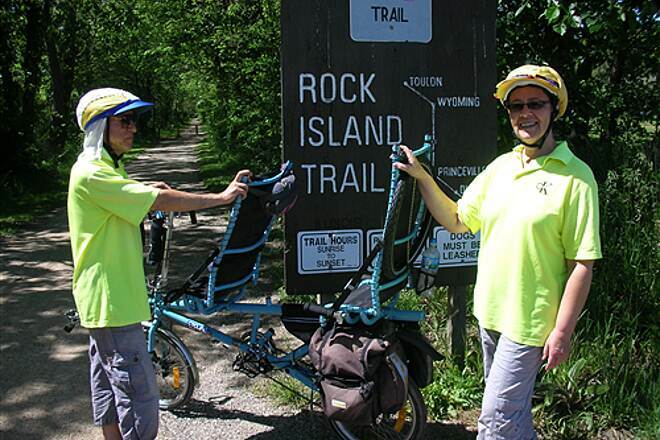 The Rock Island Trail has two distinct sections. 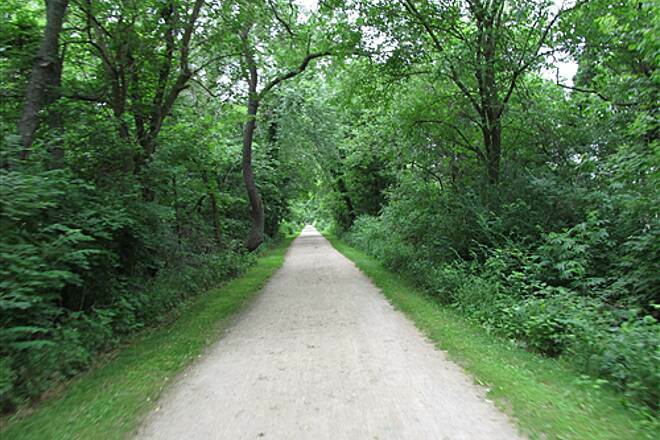 Its southern half (sometimes referred to as the Kellar Branch Trail), stretching from Peoria's riverfront to the community of Alta, has an urban feel. 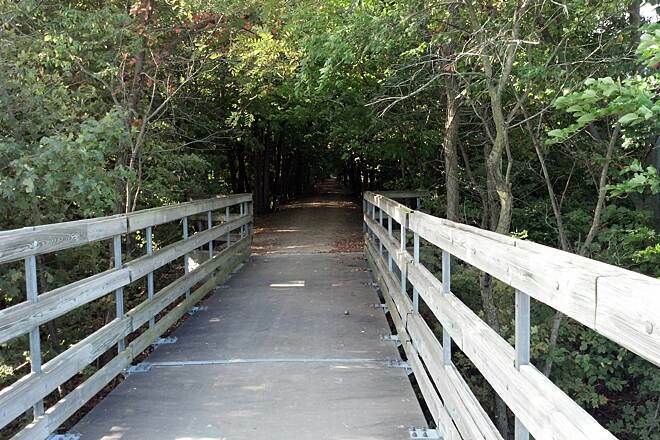 Managed by the Peoria Park District, this newer, fully paved 13-mile section was completed in 2014. 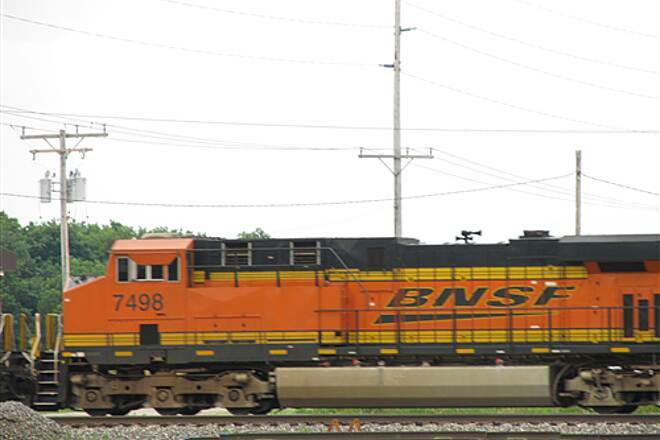 The trail's southern section provides access to two family-friendly Peoria attractions: the stunning Riverfront Museum and the Caterpillar Visitor Center, showcasing exhibits by the familiar black-and-yellow branded construction equipment company that's headquartered here. 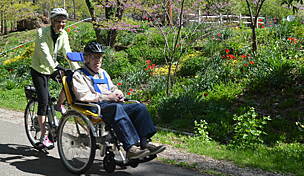 Older, but no less worthwhile attractions, include the historical Springdale Cemetery founded in 1855 and Glen Oak Park, which dates back to the late 1800s and houses a zoo, botanical garden, fishing lagoon and other recreational amenities. Note that the Peoria section includes two short on-road sections between Abington Street and War Memorial Drive. 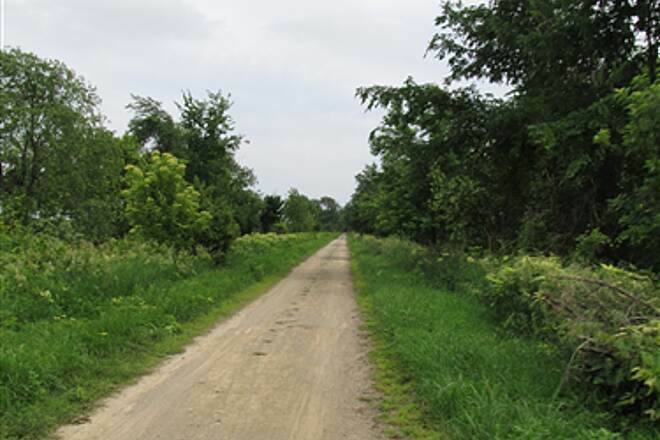 The northern section of the trail runs from Alta, in Peoria County, to Toulon, in Stark County, connecting the towns of Alta, Dunlap, Princeville, Wyoming and Toulon. 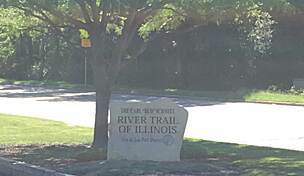 This crushed rock portion, stretching more than 20 miles, has been managed as an Illinois State Park trail since 1989. Its connecting links through small towns are along well-marked streets with light traffic. 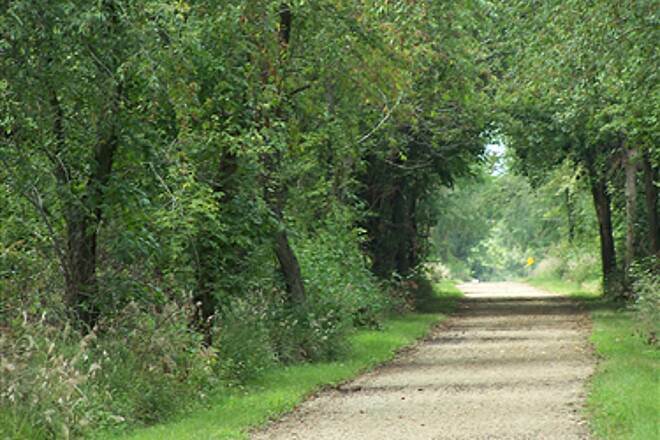 This trail paints a great picture of central Illinois as it travels through friendly small towns, classic Midwestern farmland, and woodlands. 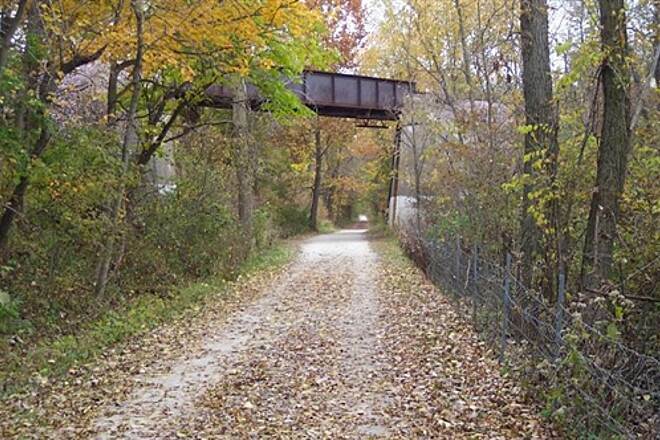 The trail owes its name to the Peoria and Rock Island Railroad Company trains that once ran passengers and freight on this line. Heading north from the Peoria Heights trailhead in Alta, have your camera ready to capture the views from the first overlook that comes up quickly. 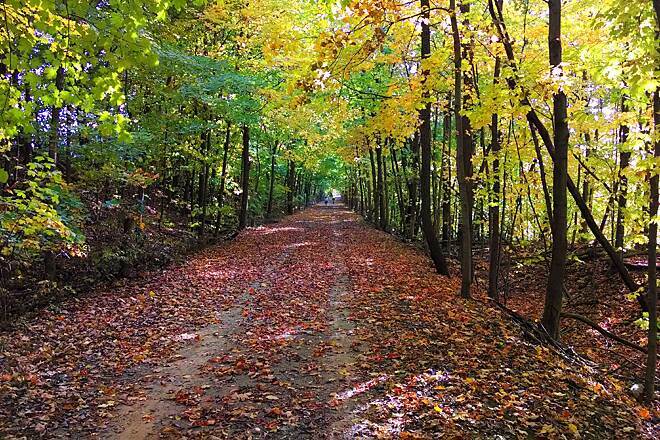 The farm and woodland setting of much of this trail is definitely picture-worthy. The corridor continues its straight-as-an-arrow path through farm fields as far as the eye can see. 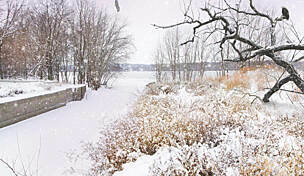 The trees lining the trail offer respite from the sun and also harbor a wide variety of bird life. About 6 miles north of the county line trailhead, the fields start giving way to the outskirts of the small town of Wyoming. Upon entering Wyoming proper, look for the trail headquarters on the left. 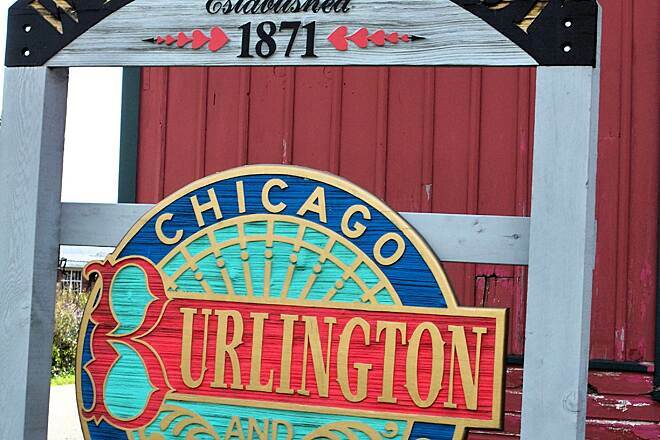 The restored Chicago Burlington & Quincy Depot, a bright, barn-red building, is absolutely beautiful, complete with the restored wooden cantilevers on the roofline. 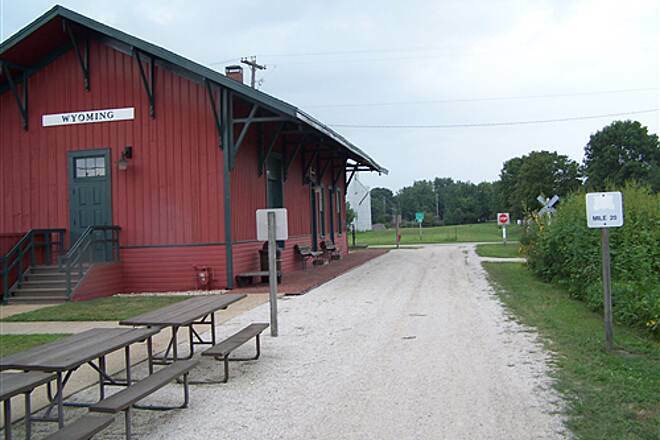 The depot also houses a visitor center and railroad museum. 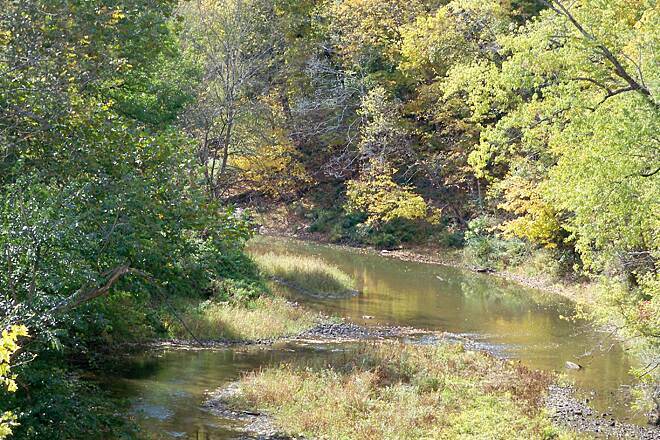 The scenery becomes more heavily wooded as you leave Wyoming and enter the Spoon River area. 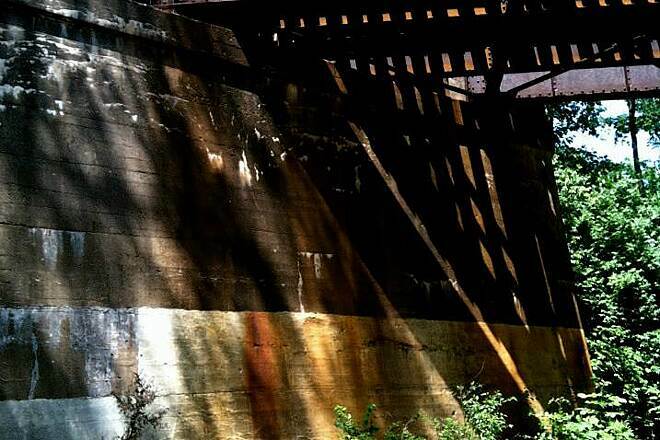 The Spoon River is a great spot to stop for a rest and admire the trestle bridge that spans the river. 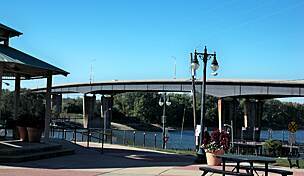 The bridge has observation bump-outs that offer a convenient rest stop, with the wooded river valley for a backdrop. After a mile, you leave the tree cover behind, and the scenery switches back to farm fields for the remainder of your journey. State Route 17 indicates your imminent arrival in Toulon, where the trail ends just east of town. To access the Alta trailhead, take Interstate 74 to State Route 6 and head northeast for 5.5 miles. Take Exit 5 and turn north onto Allen Road. About 0.4 miles ahead, follow the main traffic flow to the left, as the road westward becomes Alta Lane/West Alta Road/County Highway 21. The trailhead is a half-mile ahead, on the right. To reach the midway trailhead from I-74, take SR 6 north to Exit 2/US 150. 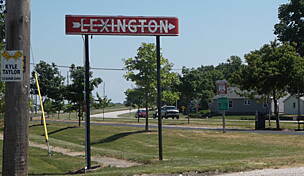 Turn right at the exit and travel west on US 150 for just shy of a half-mile. Take SR 91 north through the towns of Dunlap and Princeville, for about 19 miles, and then turn right on County Line Road. The trailhead is on the right in a half-mile. 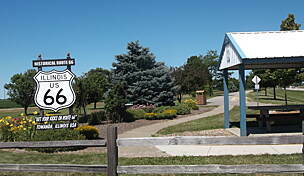 To access the Toulon trailhead from I-74, take Exit 71 to SR 78 north for 17 miles and turn right on SR 17. Follow it for just over 4 miles, through Toulon to the trailhead on the left, just east of town. Parts of the Rock Island Trail are washed out in between the towns of Toulon and Wyoming, Illinois from excess rainfall and minor flooding that occurred a few years ago, (according to some local residents I encountered on the path). However, these areas can be navigated as long as a sturdy mountain bike is fitted with thick tires. I picked up many fallen branches along my ride and I would recommend you to do the same to prevent blowing a tire out since leaves are beginning to fall rapidly. In addition, the benches and signs are beginning to deteriorate and many need to be replaced. Once you reach Wyoming, the trail is in much fairer condition, (although watch out for the occasional ground hog burrow). 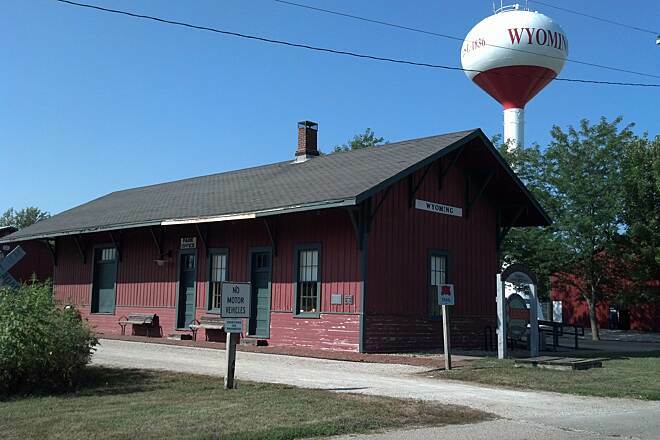 The Wyoming section includes an old train depot; reflecting much of the history as a frequent railroad stop in the 1800's. Restrooms and drinking fountain were in good condition to my surprise. I saw garbage cans around to deter litterers which helped. BE AWARE-- Around mile marker 13-14 there is one section of the trail that is completely washed out on the county border before PEORIA County. 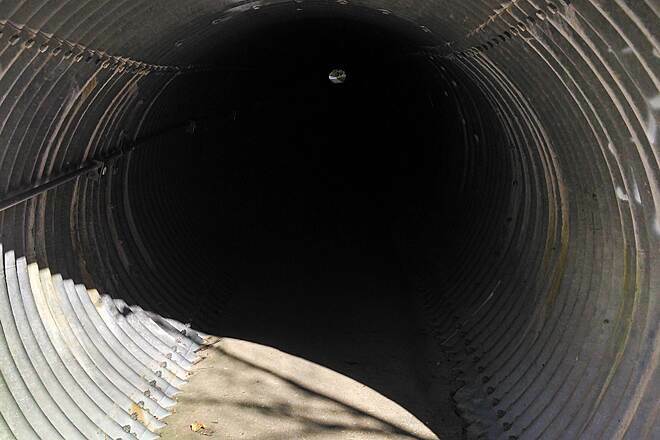 This section can be crossed since they're are large enough pipes to walk across. I would not recommend crossing this area to anybody is not comfortable with getting dirty or does not have the capability of climbing a steep hill since you have to be able to carry your bike across. 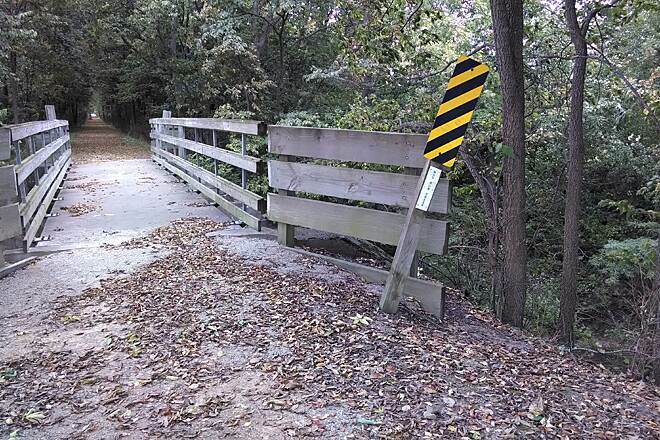 Sadly, there were no signs letting anybody know the bridge was out. 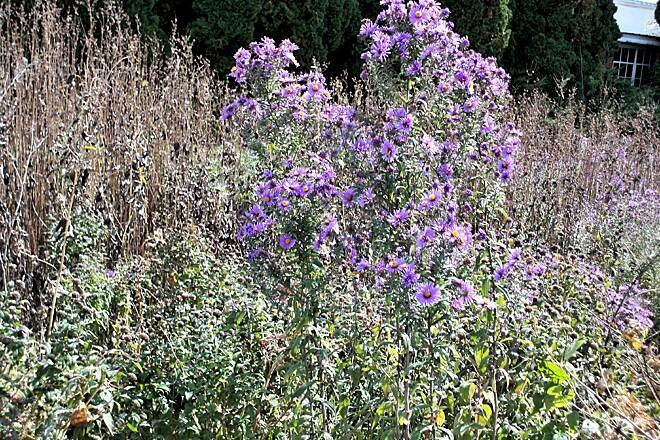 Just a barrier among the weeds. 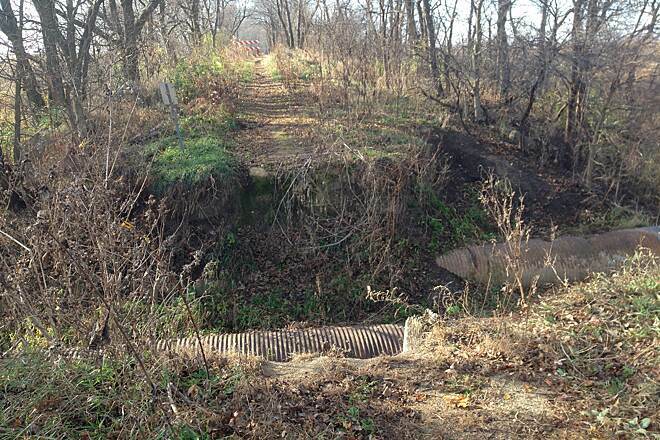 Surely, the DNR and local communities must work together to fix this crossing. Once in Princeville, you can visit a small number of local stores to eat or drink (I stopped at CASEY's). Most of the residents are fairly friendly so don't hesitate to ask if you have a question. The last two towns seamlessly transition very well towards the latter stages of the trail with a little more scenery available. Also this section seemed to be a little bit hilly. As such, the last ten miles of the Rock Island Trail were the in the best condition overall but not perfect by any stretch. 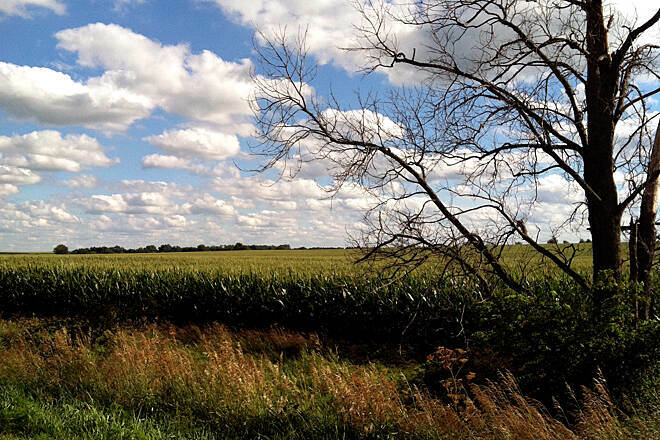 Overall, I saw a few deer, bluejays, and large amounts of squirrels that seemingly play chicken with riders,and many farmers hustling in their combines. More riders were spotted the closer to Peoria. I encountered well over 30 people. 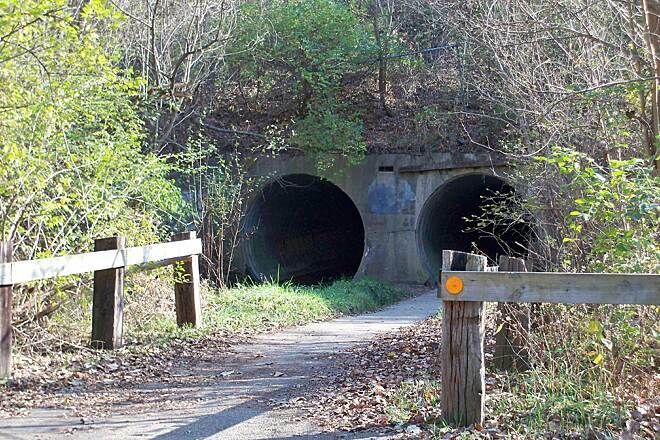 With a needed few improvements to the trail,this can really be something the community can market and build upon attracting more users to the area. Overall, I was cautiously optimistic but left satisfied. I enjoyed the trail but with minor damage in some segments I would give the trail a B-. 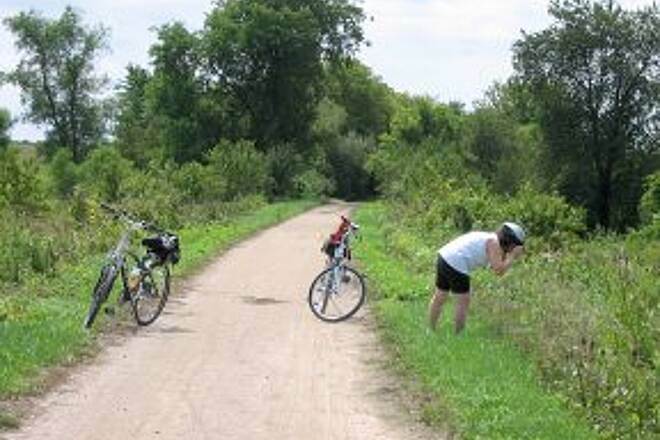 It's 'in the same condition as the Hennepin Canal Trail in many respects but has much more to offer riders since towns are incorporated into the trail and are only 5 miles apart. I have ridden all of the currently completed portions from Peoria Heights to Toulon. Wish they would fix the washout 3 miles North of Princeville though. This trail is a nice mix of environs. The newer, urban section in Peoria takes you by typical city features: Parks, shopping centers, neighborhoods; roadways, street crossings, bridge and tunnel. 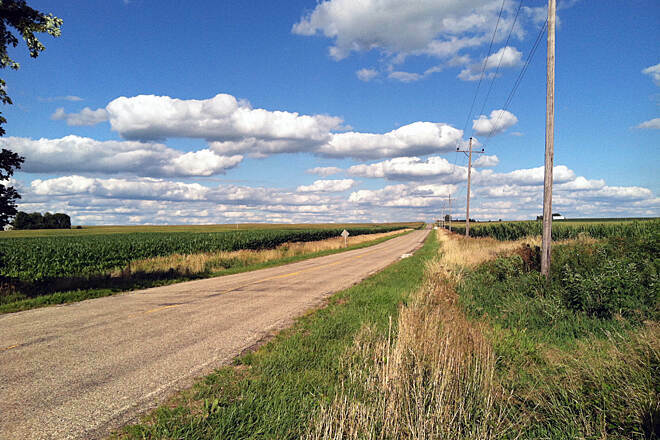 The older, State Park section of the trail to the north has lots of open country with a few small towns. There are friendly folks along the way. 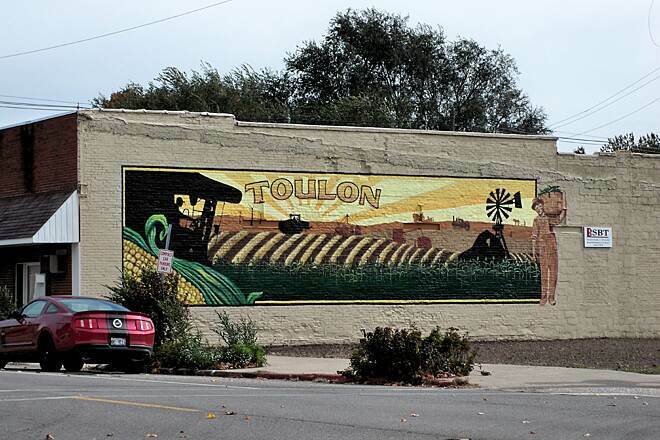 When we rode to the northern terminus at Toulon, we ate lunch at Connie's Country Kitchen. When we arrived, she was just closing up after the abbreviated lunchtime hours; but she invited us on in, served us, and even sat down with the help to join us, all at one table. When we were leaving, she ran ahead of us to the newspaper office on the corner and got the editor to take a picture of us and write about our visit in the Stark County News! 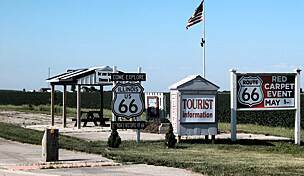 Along the way, we especially enjoyed the area of the long tunnel under Route 6, the train museum in Wyoming, and the beautiful Spoon River crossing. We came from Melbourne, Australia to sample a few cycling rail trails. We brought our tandem recumbent bike with us. We stayed in AmericInn Hotel not far from the trail. However, the staff did not have any info about it. And they could not even tell us where it is located or were it starts. We drove around for a while remembering the trail from the Google search but to no avail. Suddenly it appeared to us on the cross roads. We asked local walkers for parking. We were told that the Trail is soft after rain. It rained that day. We cycled instead next day to Princeville and back. It was Sunday and the Trail was well used by walkers and cyclists. It was hard going though, as the surface was very soft gravel and with paddles everywhere. However, the sun was shining and we enjoyed the rural scenery. 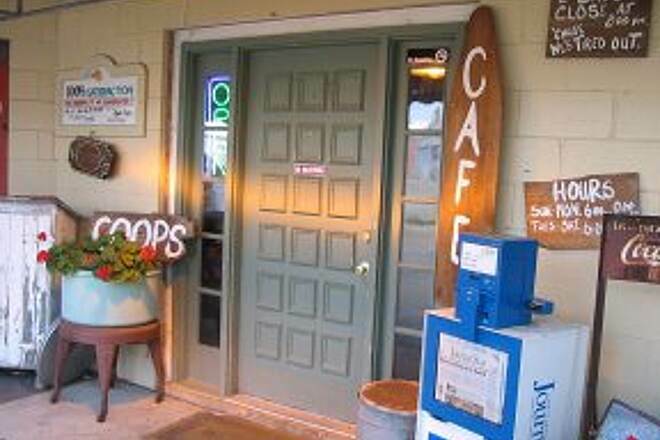 The restrooms were only available at the start and in Princeville. We had plenty of water with us as it was hot and humid. On the whole, the trail is very popular, tranquil and picturesque, but the surface needs attention. 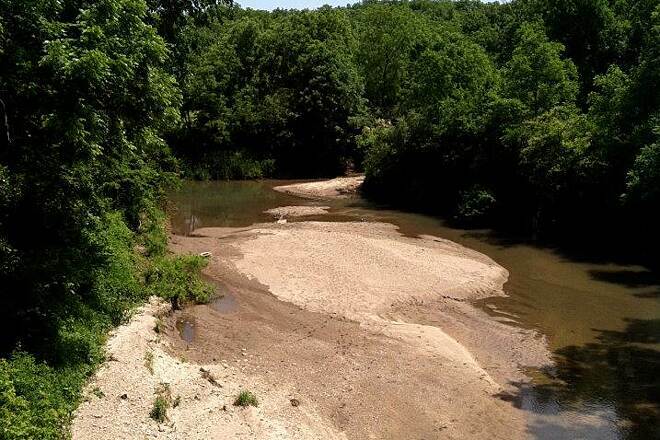 We enjoyed the experience and moved on driving to another Trail along the Hwy 55 to Maddison County Trails in St. Louis. We left a few photos of the Trail for posterity. 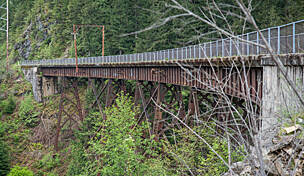 I through hiked the Rock Island Trail on April 2nd and 3rd of 2012. Here in central Illinois, like much of the country, we had unseasonably warm April weather. I was on vacation, so I decided to through hike the Rock Island Trail. To through hike the big boys you have to start somewhere so I figured that a three day and two night hike on a flat trail was a good place to start. I packed my 75 liter High Sierra "Appalachian Trail" backpack to the brim and prepared to start. The weather was overcast each day and in the temperature was in the low 80's by mid afternoons, so it was a sweaty slog . I started in Alta at approx. 2 p.m. where my wife and daughters dropped me off. The Alta to Princeville section of the trail is where you will see the most people on the trail. You see the most people near the cities of Alta and Dunlap. The trail traffic thins out as you proceed north until you approach Princeville where you will begin to see a few more people, but not nearly as many as near Alta and Dunlap. Hiking the Rock Island Trail is like hiking through a tunnel of trees with it's canopy of branches and leaves above enclosing the trail. In most places you are walking along on a raised earthen bed with a smooth rock surface. There are also places of open hiking so be prepared to handle the sun, but with my through hike being in early spring the low angle of the sun kept me mostly in the shade. I had to be in Princeville by 7 p.m. for a meeting so I got to it. I hiked the ten miles from Alta to Princeville by 5 p.m. I initially began my hike with a two liter camel back of water. I did not bring anything for water purification, thinking that the two liters would get me the ten miles to Princeville. That proved to be a mistake. I ran out of water two and a half miles from Princeville. Without any water purification methods, I walked the last two and a half miles thirsty. There were many areas of standing stagnant water along the trail that could have been used in an emergency, and there were a few small clear running streams that I could have refilled at had I take some type of water purification. I also forgot to take my hiking poles and after about two hours of hiking my hands had begun to get swollen so I called my wife and had her come to Princeville with my hiking poles and to eat dinner. My wife brought our daughters and we ate dinner at an authentic Mexican restaurant named "Los Jimadores", it was awesome! There is also a Casey's General Store gas station, and a small grocery store in town to get essentials from. After dinner I attended my meeting and I was back on the trail in the dark by 9 p.m. Walking on the trail after dark is posted as being prohibited but I had to go about another mile to get to where I had permission to camp. So I hiked during the well moonlit night. The moon was so bright that I did not even need to use a light, even with the leaf canopy above. When I got to my camping spot I pitched my tent and slept like a baby to the sound of a moderate breeze and a few coyotes off in the distance. I broke camp the next morning and hit the trail for day two. I was refreshed from a good nights sleep and eager to go. Almost as soon as I started hiking I had a very large deer run across the trail about ten yards in front of me, it was very cool! As I hiked along I through the morning I could feel that I was beginning to get blisters on the pads of my feet. (Quick point, do not use "Dr. Scholl's" insoles to hike with, they are great for casual use but not for long hikes. Dr. Scholl's absorb and hold too much moisture from sweat and they have a porous cloth surface which causes your sweaty socks to stick the top surface of the insole. This is what causes blisters to form, friction. I now use "Superfeet" which do not absorb moisture and have a much slicker top surface that allows for your socks to slide across them without causing friction.) Anyway, I stopped at one of the many benches and picnic benches along the length of the trail to address my forming blisters. As I sat down and took off my boots and socks. This is where I experienced my first act of trail magic. As I was attempting to apply moleskin around my blisters a kindly sixty plus year old man stopped by while riding his bike on the trail. He asked me where I was headed, having seen my forty five pound 75 liter backpack sitting beside me. I told him that I was going to attempt to through hike the trail if my feet allowed me to do so. He began to dig in his small saddle bag of supplies to see if he had anything to offer me for my feet. I politely told him that I had everything I needed but he continued to look for anything that he could offer me. When he finally had to accept that he had nothing to offer me, he reached in his pocket and handed me something telling me that this might help me when I arrived in the upcoming town of Wyoming. I took what he gave me and saw that it was a small wad of one dollar bills. I attempted to give it back to him stating that I had brought money for the trip. He told me to buy something for my blisters when I got to Wyoming. I insisted that he take his money back but he refused. He got on his bike and began to ride away telling me that I could not catch him on his bike so I had to keep the money. As he rode away he yelled back for me to buy something for my blisters when I got to town. I counted the money and he had given me nine dollars. I was touched by this act of unselfish kindness. So, I patched my feet as best as I could and hobbled the last two miles to the town of Wyoming. Once in Wyoming, I found a Dollar General where I used that nine dollars to buy more moleskin, a roll of duct tape, and something to drink. After patching up my blistered feet with the moleskin and wrapping duct tape around my newly patched blisters, I was off again and walking much better thanks to the trail magic of a kind man. In Wyoming you will also find a Casey's General Store, a small pharmacy, a veternarians office if you are hiking with your dog, and a small diner. One thing I will mention at this point is this, the Rock Island Trail needs to post directions in Dunlap, Princeville, and Wyoming, where the trail enters each town and then stops. Having directions posted upon entering each town on how to find where the trail picks up again would really help. Thankfully I work in the area and I knew where to go in Dunlap and Princeville to pick up the trail again, but when I got to Wyoming I literally had no idea. So I asked the town policeman who gave me almost no help. He just pointed and told me that I could not miss it. He was not being rude, he just did not know how to explain to me how to get back to the trail. I walked in the general direction of his point and to my surprise sitting in a tree in the middle of town and only fifteen feet above ground was a turkey vulture. I began to wonder about the town of Wyoming. I walked on and moments later I finally saw the trail. Sadly, I had to walk through someone's side yard to get back on the trail since I was not at the restart point of the trail, but I was back on the trail nonetheless. Once I was back on the trail in Wyoming and heading north out of town, I was quickly back to my three miles an hour stride and eating up trail on my moleskin and duct taped feet. 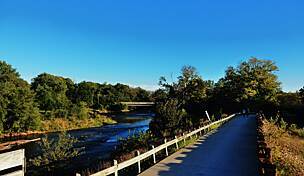 It wasn't long before I was at the Spoon River bridge crossing. 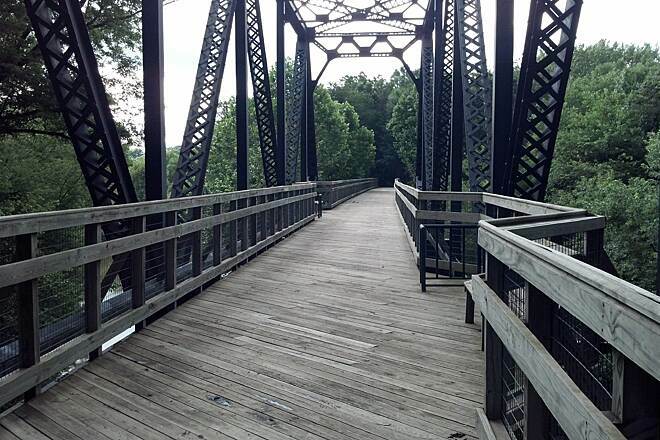 The bridge at the Spoon River is an old rail road bridge that has been refitted for hikers. Just off the trail at each end of the bridge are footpaths worn into the hillside from countless animals, hikers, campers, nature lovers, and fishermen. 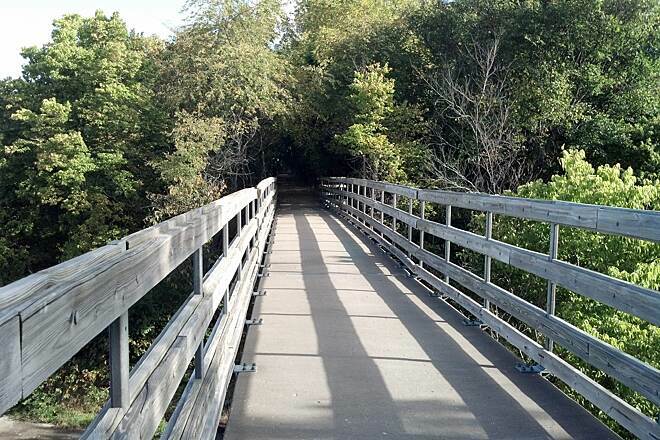 These paths lead down to a large open flat area near the river, from the bottom the bridge is about forty five feet above. This is where I should have camped as it was starting to get very windy and it looked like rain was eminent. But since it was such a public area I decided to move on to find a more secluded area to camp, that proved to be a poor decision. I should have stayed down in the valley out of the wind, but high enough to no have to worry about river swell if it rained. Deciding to move on, I figured that I could hike along and find a farm house where I could get permission to camp overnight on their property. Sadly, I was wrong. As darkness began to creep in at about 6 p.m., remember it is spring and cloudy, I had to find a spot to camp. I knew that this meant camping without having the permission of the owner, and I did not like it at all. I searched the next three miles but could not find anything along the trail flat enought except for being on a farmers unplowed field, and I was not about to do something that disrespectful. I finally settled for a patch of grass off a field that was a hillside. I know, putting a tent on a hillside is as smart as smoking in a fireworks factory, but I could not disrespect a farmer by putting my tent on his field without permission even though it had not been plowed or tilled this spring. Needless to say, I did not sleep well. First, the winds blew my tent around all night long with winds that were a constant 25-35 mph. Secondly, I my Thermarest mattress continually slid down to the end of the tent since the tent was on a hillside. 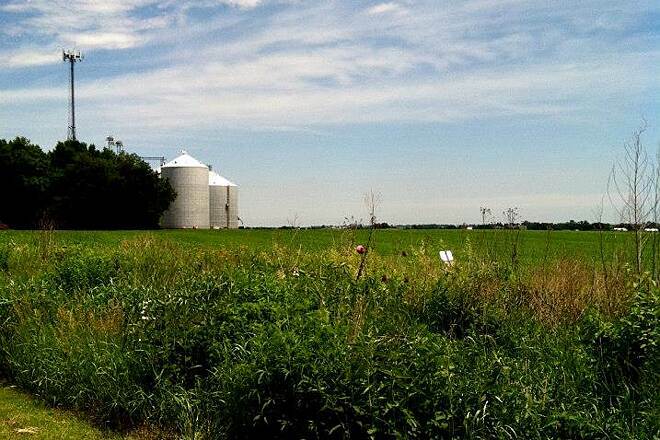 And lastly, I had dreams about a farmer coming out and being upset that I was on his property without permission. Let me tell you, I was glad when morning arrived. I broke camp on the third morning and headed towards the City of Toulon. I was happy to be back on the trail again, even on my duct taped repaired feet. I hiked about three miles that morning and I arrived in Toulon, the end of the trail. I called my wife and had her bring the kids to Toulon where we had lunch and drove home. 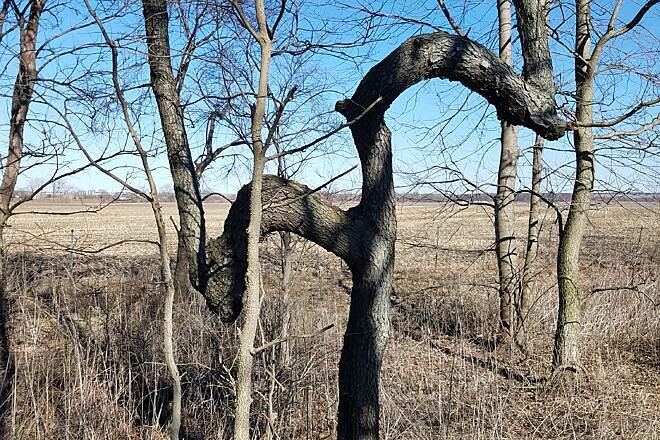 During my tranquil through hike of the Rock Island Trail I saw many beautiful sites, I crossed several types of bridges, saw many different kinds of animals, saw many old farm properties; but in general I saw the beauty of undisturbed nature unrolling before me as I hiked along. 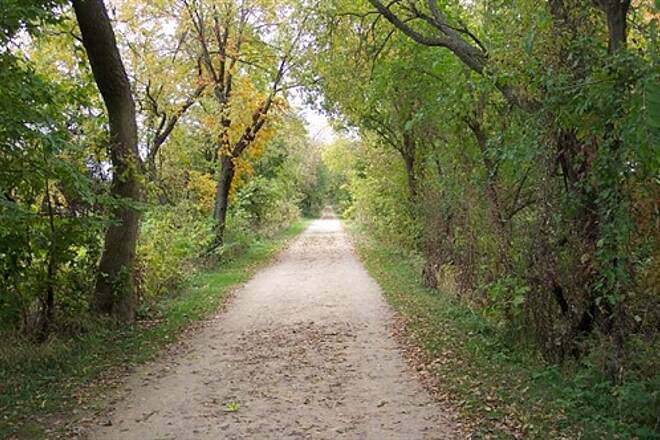 I truly enjoyed the peace and solitude of the Rock Island Trail. Many lessons were learned and I cannot wait to do it again! 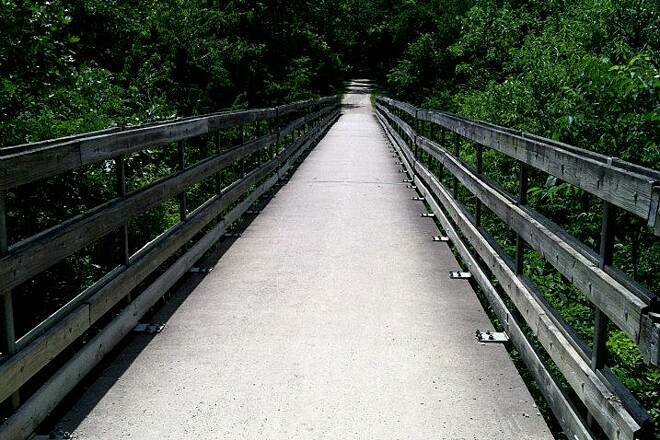 This path is very well maintained and nice to ride. Unfortunately I went shortly after a good rain and the path was very soft and difficult to ride. After 14 miles I had to turn around and go back. What I found strange was after riding 28 miles I saw very few other riders, and I rode on a nice warm Saturday afternoon. One nice perk was when I stopped at the train depot in Wyoming to rest on the way back. A lady came out of the depot and asked if I was OK and if I wanted to come inside to cool off. The hospitality of the locals is very nice. Please, use these trails and let everyone know how much you enjoy having them near your home. 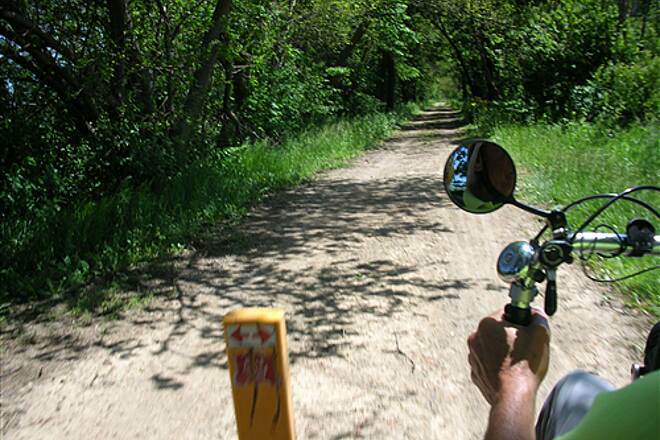 My wife and I enjoy the trail...not too hilly...and the best part is plenty of scenery, berries and wildlife. 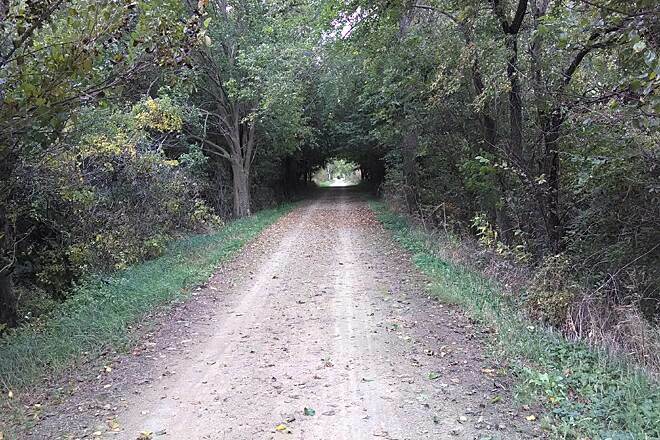 We have just started trail biking and have done 10 - 8 mile stretches of this trail so far...it is definitely worth the effort and time to experience this wonderful trail...it is right up there with some of the best Illinois has to offer for the serious to novice bike enthusiast. 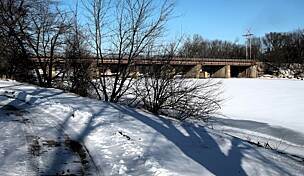 "The extension of the Rock Island Trail to Pioneer Parkway is in my opinion the best part of the trail. It winds past meadow and through forest, over a stream and through a tunnel. I appreciate that most of the main trail is straight because it was created over the path of a former railway, but I also appreciate having a section of trail with a more interesting meandering path. We always start our bike trips at the newer south end at Pioneer Parkway!" 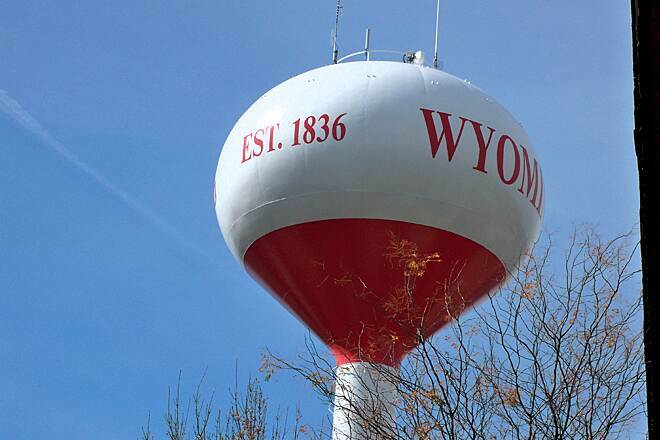 "Enjoyed a family ride here beginning in Toulon and travelling past Wyoming a bit. 7 1/2 miles one way. Kids enjoyed the wildlife which included a small toad (live), a crawfish (dead), and headless snake (definitely dead)! Many butterflies and ""ant homes"" along the path. Really cool trestle bridge to cross close to Toulon. We only saw about a dozen other people on the path, all bikers except for one runner. Extremely quiet, very clean (path, not the people! Actually the people were pretty quiet and appeared clean as well... ha! ha!). 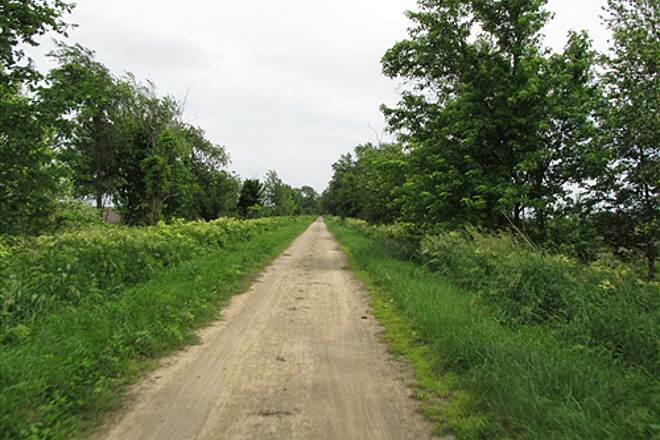 Path passes through farmland and there are several spots that are treeless so be sure to take sunscreen and plenty of water. It's not entirely out in the open though. Passed through some woodsy areas as well. Restrooms were very clean. The depot at Wyoming looked really neat, but was not open when we were there. Pine cones were spotted near here (important to kids and crafters!) Kids enjoyed a small park across the road from the depot. Park had a wooden ship with slide, swings, pole to slide down, etc. A great family outing." 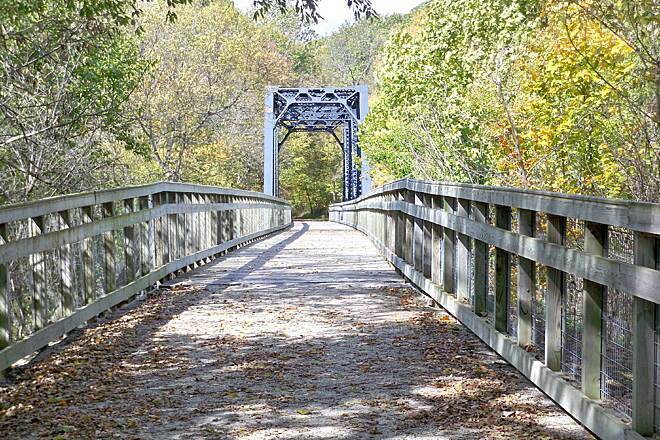 "This trail is shared by walkers, runners, bikers, and residents alike. 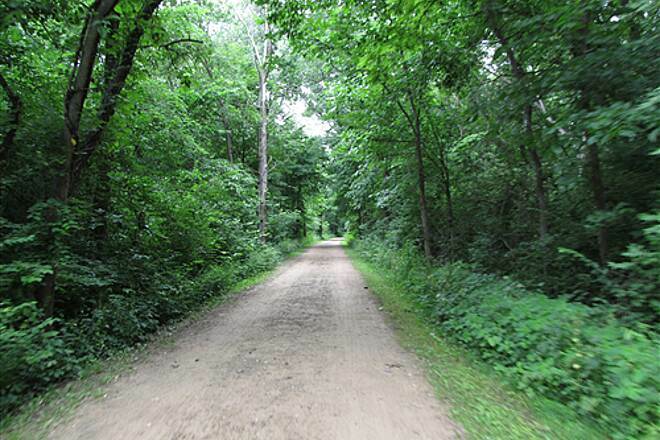 It is a quiet, clean trail located away from traffic and has abundant wildlife at certain times of the year. 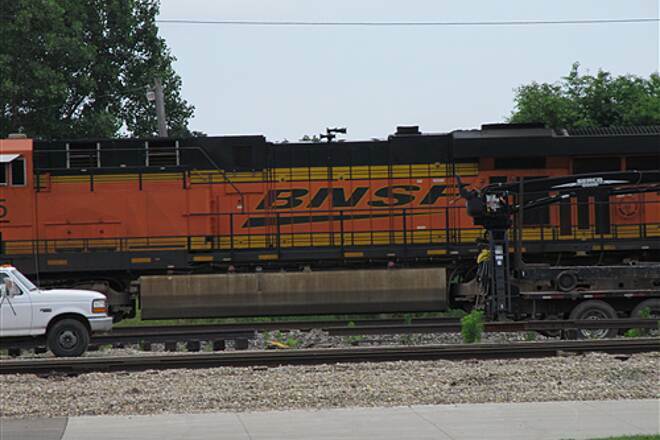 While only 27 miles long now, within the next few years, it will increase to about 52 miles as expansion begins to lengthen the trail through Peoria on its way to Morton. My running friends and I use it for long training runs as well as relaxed shorter 10 milers. It is well equipped with water and toilet facilities. One of the best features is that those who use the trail help take care of it.... putting litter in its place... and helping to assure it is a safe place to be. Each year, a 50K road race is held, running from Toulon to Peoria along the trail. It attracts runners from all over the country, and as these longer races gain in popularity, this classic run will surely be one of the most popular. Along the trail in Alta, a residential development is being created with upscale homes. 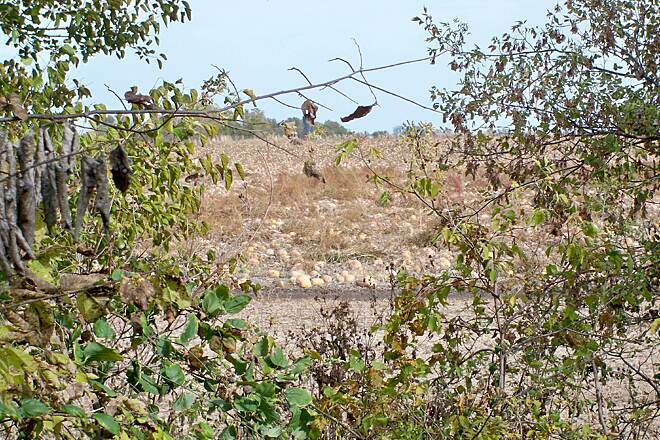 This give evidence that the presence of a trail like this one is an attractive factor when locating a residential development."